Even thought the Arizona Coyotes lost to the Edmonton Oilers Saturday, the team was still able to come away with a point and still retain the second wild card spot in the Western Conference. Their lead over Minnesota dropped to two points as the Wild won last night. However, with a legitimate shot a playoff berth this season, the Coyotes may get even better news if they can get in. According to AZ Central’s Richard Morin, there is a solid chance that goaltender Antti Raanta could be healthy enough to return for the playoffs. That could create an interesting controversy, however, as one of the key reasons for the team’s success has been the recent play of backup Darcy Kuemper. The 28-year-old has been nothing short of outstanding since Raanta went down with a knee injury on Nov. 27, posting 20-11-3 record, with a .924 save percentage and a 2.40 GAA as the team’s starter. While Raanta’s return would change things in net, the team seems likely to stick with the hot hand. The Vancouver Canucks head coach Travis Green reported that forward Sven Baertschi has been cleared for contact but is not expected to play Sunday. The 26-year-old has been injured for a large chunk of the season with a concussion, but was more recently diagnosed with post-concussion syndrome in early February. In total, Baertschi has only appeared in 22 games this season, although he has struggled with injuries his entire career. Baertschi has never played more than 69 games throughout his career. There were a few people surprised when Calgary Flames forward Sam Bennett was a scratch Saturday. However, Wes Gilbertson of the Calgary Sun writes that the word is that Bennett is day-to-day with an upper-body injury. “We were hoping when we got into Winnipeg, in the morning, it would be better,” Calgary head coach Bill Peters said. “And it went the other way. It was worse, so he couldn’t go.” Bennett is second on the team in hits with 120 and has 12 goals and 14 assists in 69 games. The Calgary Flames’ Sam Bennett doesn’t have to worry about anything as Kevin Kurz of The Athletic reports that forward will not receive any supplementary discipline from the Department of Player Safety for his hit on Radim Simek Monday night. With the Flames up 8-5 and with 25 seconds remaining in the game, Simek was passing a puck when he took a hit from Bennett. Simek stayed down on the ice for some time before leaving the game. There was no medical update after the game. The Vegas Golden Knights got some good news as winger Max Pacioretty was on the ice for the pre-game skate, according to SinBin.Vegas. The veteran is not expected to return to the lineup today, but it’s an improvement as Pacioretty hasn’t been on the ice since he was injured on Dec. 17. Head coach Gerard Gallant said Pacioretty remains day-to-day, according to Las Vegas Review-Journal’s David Schoen. Pacioretty has missed six games due to his lower-body injury, but the team hasn’t missed beat with Brandon Pirri taking his place in the lineup. The 30-year-old has 10 goals and 19 points in 30 games this season. Adrian Dater of BSN writes that the Colorado Avalanche expect to get back winger Colin Wilson sooner than expected. The winger suffered a shoulder injury and was placed on injured reserve on Dec. 22, but could be ready to play by next week. Wilson was playing well in a middle-six role and has eight goals and 13 goals this season. Winnipeg Jets prospect Kristian Vesalainen was named KHL Rookie of the Month for December, according to Pekka Jalonen of Iltalehti. The 2017 first-round pick started the season with the Jets and played five games, but after eight games in the AHL, opted to exercise a provision in his contract that allowed him to return to the Europe. He has four goals and 10 points in 13 games for Jokerit. Sportsnet’s Iain MacIntyre writes that after watching the impressive play of New Jersey Devils goaltender MacKenzie Blackwood, who shutout the Vancouver Canucks 4-0 Monday, the Canucks should consider bringing up their own goalie prospect in Thatcher Demko. The 23-year-old is from the same draft as Blackwood and this might be the right time to give him an extended look, especially with the uninspiring play of Anders Nilsson as the team’s backup. Demko did miss the first two months of the season to injury, but he has posted a 2.63 GAA and a .909 save percentage and has little left to prove in Utica. The Canucks could consider moving Nilsson to a team in need of goalie depth before the trade deadline. The Nashville Predators have placed goaltender Pekka Rinne on injured reserve after leaving Friday night’s game in Calgary, according to TSN’s Ryan Rishaug. The transaction means that Rinne will be out a minimum of three games and won’t be able to return until next Saturday against Edmonton. Rinne exited the ice early in the third period soon after colliding with teammate Kevin Fiala as the two got tangled up on Sam Bennett’s goal 2:20 minutes into the period. Rinne stayed in for another 2:43 seconds before finally being replaced by Juuse Saros. According to the Tennessean’s Paul Skrbina, head coach Peter Laviolette said it wasn’t the team’s or Rinne’s decision to leave the game. He left due to the league’s concussion protocol. “We didn’t pull him, so something was wrong,” Laviolette said. Saros is expected to fill in for the Predators for tonight’s game against Edmonton. The team intends to recall Miroslav Svoboda from Atlanta of the ECHL for tonight’s game, adds Rishaug, but considering that he’s in Atlanta and the game in Edmonton, it might be a challenge to get him there by game time. It’s a big loss for the Predators. Rinne, last year’s Vezina Trophy winner, is 3-1 through five starts this year, posting a 2.10 GAA and an impressive .929 save percentage. The team is lucky to have Saros, who is Rinne’s eventual successor, although Nashville has been discussing an extension with Rinne recently. Saros has won all three of his appearances this season and boasts a 2.23 GAA and a .919 save percentage. Svoboda, the team’s seventh-rounder in 2015, has been impressive in two appearances in the ECHL, posting a 1.50 GAA and a .946 save percentage. The Colorado Avalanche added a young forward recently when they claimed Marko Dano off waivers from the Winnipeg Jets, and he may get an opportunity right away once his visa status is sorted out. That’s because the Avalanche will be without J.T. Compher indefinitely following a head injury, according to Adrian Dater of BSN Denver. Compher received what looked like a direct head shot from Sam Bennett on Saturday night, though it’s not clear if that’s exactly when the injury took place. Compher, 23, was off to a great start for the Avalanche this season with three goals and four points in his first five games. After making his full-season debut last year, the Avalanche had inserted Compher as a key part of their forward group and a player to build around going forward. Finally some of the assets from the Ryan O’Reilly trade are paying off, and the 35th pick from 2013 is no exception. Colorado impressed last season jumping all the way up the standings and into the playoffs, but they’ll need solid secondary scoring options to contribute if they’re to progress as an organization. Not all the scoring pressure can be placed on Nathan MacKinnon and Mikko Rantanen forever, and Compher was expected to be one of those who took on some of the burden. After recorded 13 goals and 23 points last season, his quick start was encouraging and had earned him extra ice time in recent games. Now the team will have to find someone else to take those minutes, and hope that Compher can return before long without any long-term concussion effects. Through four games this season, young Calgary Flames forward Sam Bennett has just one point. He has yet to score a goal and has taken just six shots. He is seeing just over ten minutes of ice time per game, down more than four minutes from his career average. Bennett is currently on pace for just over 20 points on the year. It seems like a disappointing start and perhaps just an aberration for the 2014 fourth overall pick. In reality, it is par for the course for the 22-year-old forward. Since his strong 36-point rookie campaign in 2015-16, Bennett has failed to improve his production and has seen less and less ice time. This is simply a continuation of the trend. To say that Bennett has failed to live up to the expectations of his lofty draft position would be to understate the issue. 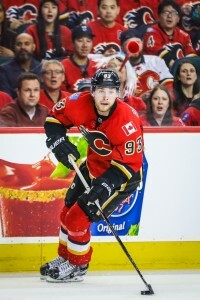 Drafted ahead of the likes of William Nylander, Nikolaj Ehlers, Dylan Larkin, and David Pastrnak in 2014, the Flames certainly expected far more out of Bennett thus far. His overall production is decreasing, he has never cracked 20 goals or 20 assists in a season, and a center when drafted now plays almost exclusively on the wing. Bennett has simply not at all been what the Flames thought they were getting at fourth overall. Meanwhile, the team is without a playoff win in the three years since Bennett became a regular and patience is running out in Calgary. Bennett has shown flashes of immense ability, but has lacked consistency and, more than anything, has been a poor fit in the Flames’ system. With the hire of new head coach Bill Peters, many expected a turnaround from Bennett this year, but it has been far from it so far. It would seem that Bennett’s time in Calgary is almost up, right? Wrong, in fact. Sportsnet’s Elliotte Friedman led off his latest edition of “31 Thoughts” by acknowledging the trade interest in Bennett, but doubting that GM Brad Treliving and the Flames were ready to move on. Calgary is wary of trading Bennett while his value is at its lowest to a team seeking to buy low on the talented forward and finally find a way to get the most out of his ability. Friedman expanded on his comments with Sportsnet Radio 960 in Calgary, stating that the Flames appear to be obsessed with avoiding the mistake that provincial rivals the Edmonton Oilers made in trading away Taylor Hall at well below his true value. Hall was also struggling to meet the expectations of his draft slot, first overall in 2010, and it was compounded by the team’s struggles as well. Hall was traded to the New Jersey Devils for Adam Larsson and is now the reigning Hart Trophy winner and a top ten forward in the league. The Flames could certainly use a Larsson-caliber piece in their pursuit of a playoff berth this season, but not at the cost of losing a player that they still believe has untapped potential. That is not to say that the team hasn’t considered offers, though. Friedman states that, while no deal was ever close, Calgary went “far down the road” in trade talks with several teams. Friedman specifically names the Anaheim Ducks, Montreal Canadiens, Philadelphia Flyers, and Tampa Bay Lightning as teams that he knows have had interest in Bennett before and, especially in the case of Anaheim and Montreal, likely continue to. The fact that Bennett is perceived as being available via trade would seem to indicate that the Flames continue to field offers for the young forward, even if they aren’t actively selling. While Friedman doesn’t see it happening, Bennett’s play so far this year is trending towards 2018-19 being a new career low. With a year remaining on his contract beyond this season, giving a new team the time to attempt to turn his development around, a poor season for Bennett could see Calgary finally give up on their once-top prospect. It’s fair to want to avoid giving up on potential, particularly for a disappointing return, but a point is fast approaching when Bennett can no longer be seriously compared to a player like Hall. Flames forward Sam Bennett was on the fourth line to start the season which has already fueled some speculation that he could become a trade candidate fairly quickly. However, despite his struggles the last couple of years and limited role to start the season, Sportsnet’s Elliotte Friedman suggested in an appearance on Sportsnet 960 (audio link) that Calgary’s asking price for the 22-year-old would be quite high given his age (22) and draft pedigree as fourth-overall pick in 2014. Bennett is in the final year of his deal that carries a $1.95MM cap hit which makes him a non-tender candidate in the summer if he doesn’t improve. Accordingly, it will be interesting to see if GM Brad Treliving will eventually lower the price or decide to move him for a player in a similar situation. Still with Calgary, the Flames announced that they have recalled winger Anthony Peluso from Stockton of the AHL. The 29-year-old is in his first season with them after spending last season in Washington’s organization. Peluso is best known for his pugilistic skills and has 213 penalty minutes in 144 NHL games with another 416 in 240 AHL contests. He’s not expected to play tonight against Vancouver. Despite being acquired on Monday, Blues defenseman Jakub Jerabek is still not on their active roster. It turns out that he is still looking to secure his work visa before he can actually join the team, reports Postmedia’s Jim Matheson. St. Louis will have to make a roster move before they can activate him which will probably now be sometime next week. Vince Dunn is their only waiver-exempt blueliner but it’s unlikely that they will want to take him out of their top-six. Canucks winger Antoine Roussel participated in practice for the first time since sustaining a concussion during offseason training, notes Postmedia’s Patrick Johnston. While there is still no firm timetable for his return, he is with the team for their six-game road trip which suggests he may get the green light at some point in that stretch. As Vancouver is at the maximum-sized roster, they’ll have to free up a spot before they can take him off injured reserve. The Calgary Flames have a lot of questions this offseason after a disappointing season that leaves them wondering what happened. However, the biggest question probably falls on what to do with Sam Bennett. The former fourth-overall pick in 2014 should be improving every season, but that hasn’t been the case for the 21-year-old who has seen his numbers drop every year. After putting up 18 goals and 18 assists in a promising rookie season, he has put up only 26 points in each of the last two seasons and his goals have dropped from 13 in 2016-17 to 11 this year. The Calgary Sun’s Wes Gilbertson writes the team must decide whether he can take his game up several notches or whether to use him as trade bait. Of course, you don’t want to be the general manager that trades him away only to thrive with another team, but the team needs production out of the forward and is running out of time to figure out if he is the star they thought they drafted. He has one year left after this one at $1.95MM before hitting restricted free agency again. The Chicago Blackhawks think they have found something in defenseman Connor Murphy. The 25-year-old, who was acquired in the Niklas Hjalmarsson trade last season from Arizona, struggled early on in the season with Chicago, according to Chicago Sun Times’ Mark Potash, but was one of the team’s better defensemen in the second half and the team believes he can develop into a top-four defenseman. “If you look at the way he played over the last 30 to 40 games, I think there’s reason for excitement,” said Blackhawks general manager Stan Bowman. The Colorado Avalanche is without defenseman Samuel Girard today as the young defenseman is out with an upper-body injury sustained in a hit from Nashville’s Filip Forsberg during Thursday’s game. The rookie defenseman is day-to-day. Vegas Golden Knights winger David Perron, who has been out since Mar. 26 with an undisclosed injury, says he hopes to play before the series with the Los Angeles Kings is over, but did not give a timetable on a potential return, according to SinBinVegas. The Anaheim Ducks expect defenseman Kevin Bieksa to play in Game 2 tonight against the San Jose Sharks, according to Orange Country Register’s Eric Stephens. Bieksa has been out since Mar. 12 after having hand surgery. Stephens also notes that defenseman Cam Fowler is no longer wearing a sling on his shoulder and will resume skating shortly. The blueliner has missed 13 straight games, but no timetable is set for his return. To say things have not gone well for Flames forward Sam Bennett this season would be an understatement. He finally snapped a season-long pointless streak on Thursday night and is averaging the lowest ice time of his young career at 13:23 per night. That’s hardly what anyone was expecting from the fourth overall selection back in 2014. Earlier this week, TSN’s Bob McKenzie reported (video link) that Flames GM Brad Treliving doesn’t necessarily want to move the struggling 21-year-old but at the same time, he isn’t hanging up when other teams inquire about his availability. Even though he’s off to a terrible start, he’s only a few years removed from being a high-end prospect and players with that type of draft pedigree typically get a few chances if they don’t perform with their original team. Sportsnet’s Rory Boylen examined Bennett’s situation and usage this year and one prominent question comes to mind: When is it the right time to look at trading him? It’s safe to say his trade value is far from its highest so at first glance, a case can easily be made to hold on in the hopes that he returns to form and restores some value. However, what if his struggles continue? Or, perhaps more likely, he rebounds a little bit but remains more of a supporting cast player? That won’t really help his trade value and perhaps may lower it further. They may want to avoid the situation that Edmonton had with Nail Yakupov last year where his trade value had all but bottomed out. Bennett isn’t at that spot yet but that could change by the end of the season if he doesn’t rebound. At the moment, Calgary isn’t likely to get more than a similarly-struggling young player or a rental player in return for Bennett. While the latter option would probably be a nice boost to their roster, they’d also be giving up on someone that was believed to be part of their long-term core for a player who may not be there six months later. Is the short-term gain worth it? In terms of taking another scuffling forward back, it’s likely that Treliving would rather stick with the player they know. For the time being, it’s hard to envision Calgary parting ways with Bennett despite his rough start to the year. If he doesn’t pick it up in the weeks to come, however, he’s a player who is likely going to find himself in trade speculation where talks of him needing a change of scenery will begin to pop up. If and when that happens, it will be interesting to see if Treliving will hold on to him or cut bait before his situation has a chance to mirror Yakupov’s from a year ago. The Philadelphia Flyers announced today that defenseman Andrew MacDonald will miss four to six weeks with a lower body injury. According to NHL.com’s Bill Meltzer, MacDonald stepped into a path of a slap shot from Edmonton’s Milan Lucic during a penalty killing shift of Saturday’s 2-1 victory over the Edmonton Oilers. It hit his knee and MacDonald suffered a deep bone bruise, according to CSN’s Tim Panaccio. Despite the injury, MacDonald stayed in the game. In fact, after taking the hit and going down, he still forced himself to get up and help clear the puck. The 31-year-old blueliner had a dominant performance against the Oilers, as he recorded three shots on goal, six blocked shots and played the second-most minutes on the team at 22:03. No corresponding moves have been made, although its possible the Flyers will promote defenseman Samuel Morin, who made the team out of training camp, but was a healthy scratch for four games before he was sent down to Lehigh Valley. In five games with the AHL team, he has put up a goal, three assists, 10 penalty minutes and a plus/minus of +3. While the Vegas Golden Knights await the injury status of goaltender Malcolm Subban, Las Vegas Review-Journal’s Steve Carp tweets out that Erik Haula, who was put on injured reserve eight days ago, practiced with the team today and told Carp he is ready to return to the team, but wouldn’t say when. David Schoen of the Las Vegas Review-Journal tweets that Jon Marchessault, who was placed on injured reserve on Oct. 15, also says he is ready to return to the Golden Knights lineup and said he expects to be activated for Tuesday’s game against the Chicago Blackhawks after practicing today. The team may reverse their transactions from last week and send Vadim Shipachyov and Alex Tuch back to the AHL. Both Shipachyov and Tuch tallied no points and neither had any shots on goal in Saturday’s game against the St. Louis Blues. Shipachyov received only 10:22 of ice time, while Tuch had 8:49. Kent Wilson of The Athletic (subscription required) answers mailbag questions about Calgary Flames center Sam Bennett, who has zero points after eight games. Wilson writes the lack of offense would be acceptable if he was impacting the game in other ways, but that isn’t the case. Bennett, whose first full season showed a lot of promise two years ago when he finished with 18 goals and 18 assists, took a step down last year when he only had 13 goals and 13 assists. Now his numbers look even more bleak. Wilson suggests the team move the 2014 fourth-overall pick to the wing in hopes of helping the 21-year-old’s success and promoting Mark Jankowski, who is tearing up the AHL right now with five goals and four assists in six games.